My Stitch Diary: Golden Promises - More background! Golden Promises - More background! Although I am really enjoying moving on to the second page of Golden, I'm not so keen on more background. I really want to stitch some detail! And come on! How often do we say that! 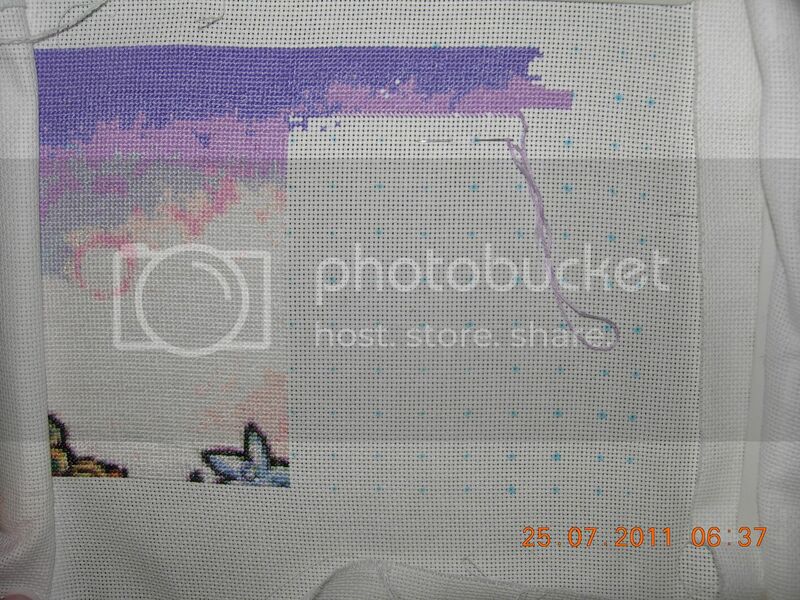 Unfortunetly I am a stickler to following my own stitching 'rules'! I will stitch in order in which the symbols appear on the page I am stitching. When I am stitching a page next to the completed page on the right (like in the picture above) I find that I like to stitch the symbols in order down the first column. I think that way I can join the two pages sooner. If I am stitching the next page to the bottom of the comleted page I would follow the symbols across the first row, again to quickly join the bottom of the first page and the top of the next page! I hope I haven't confused you too much! I think I like to do this mainly to close the gap between pages, but also it takes the guess work out of it for me. I dont' have to think about what symbol to do next! I'm going to borrow Joyse's idea and ask you all a question. How do you decide what symbol to stitch next? Do you have a process or is it more random for you? I stitch cross country, so my first color is always the color of majority... then do the next most and so on and so forth. I like stitching up from bottom left, so that dictates which symbols starts as well. What a great question. It's sort of random for me. On projects that I've gridded, I work all the confetti stitches first, then the medium stitches, then the most prevalent color last. I do it this way so I can fill in the most prevalent color more quickly, without having to constantly look at the chart. For other things, I do the symbols in bands or sections. If it's layers, like Astral Lion, I do them in layers as they go, building towards the bottom of the page. If I have sections to do, then it's really random. Whatever strikes my fancy, lol. At least the background is a pretty one!! It's looking good Vani. Keep up the good work! what a pretty background though! I pick which symbol to stitch next by which has the most stitches in that row. (well with HAEDs anyways, with other projects I just pick one) I stitch by row in HAEDs. I'm with Joysze and weestitchy.com .. I pick whichever symbol has the most stitches on the page and go from there. I tend to leave the confetti stitches for last so that I can weave the thread under other stitches as I hop all over the place. It all depends on my mood I suppose. On some projects I will pick a prevalent color and work it until it's done. On other projects, I start at the top corner and work a color until it comes to a natural stopping point, then move on to the next color underneath it. Other times, I move to a specific part of the chart that I really want to do and just work there for a while! I've found that doing what feels right when it comes to stitching works best for me rather than sticking to one particular set of rules.